Come one, come all! This two hour walking tour of the one of a kind French Quarter is perfect for those of you who are considered a little freaky, and even geeky! Everyone knows New Orleans is a melting pot! It is made up of a little of this and a little of that, much like the gumbo we are famous for! Join a "Geeky" New Orleanian who is beyond excited to take you around and give the nitty gritty details of this wild and crazy city that is full of freaks! Our tour guides are local and licensed by the city of New Orleans. They know New Orleans and look forward to showing you the city that they love. During this tour you will experience the real New Orleans! Learn New Orleans history! Hear the good, the bad, and the ugly! This tour holds nothing back! Hear the scandalous love stories that took place in New Orleans, Some ended of them ended in tragedy. 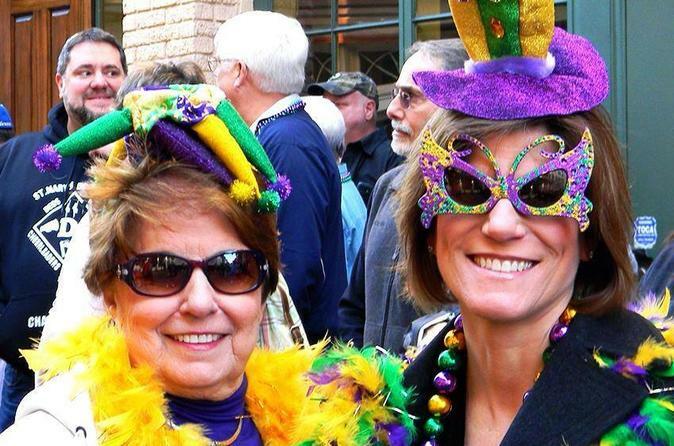 Learn about Mardi Gras traditions! Get the inside story on Bourbon Street while you visit it firsthand. While you are there the tour guide will also give the scoop on the famous drinks that you can only find in Nola! Hear about our paranormal friends that refuse move on! Hear stories of REAL New Orleans VAMPIRES and why they are in New Orleans! Learn all about Marie Laveau the Infamous New Orleans Voodoo Queen! See exactly where the Voodoo ceremonies that Marie Laveau participated in were held! If you are interested in hearing how New Orleans was founded and the events that took place over the years that molded New Orleans in the city that it is today, this is the tour for you! Interested in the paranormal? During this tour, the guide will have a paranormal detector to use so that any expected paranormal activity can be validated. This adds to the entertainment of the tour.